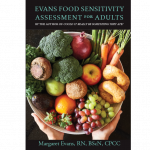 Welcome to my redesigned website and the place to purchase the newly released Evans Food Sensitivity Assessment Tool (EFSAT). This user friendly and comprehensive assessment is the result of over 30 years of work with my own family and hundreds of clients. It is intended to help both individuals and professionals determine whether or not a food sensitivity may be a contributing factor in a wide range of symptoms. Once you have determined whether or not food may be part of your challenges, the EFSAT then helps you identify the offending food responsible for your symptoms and helps you successfully make sustainable changes in your diet. Unless this food is identified and removed completely from your diet, no amount of diet adjustments, medications, or other interventions will achieve any long lasting success. It is rather like leaving a sliver in your foot and simply covering it up with more and more bandages. No matter what you do, infection eventually sets in and your problem gets worse. Most reactions to food are food intolerances and not food allergies and there are NO accurate tests available for them. Even elimination diets are often ineffective due to issues with compliance of both parent and child as well as many other factors. 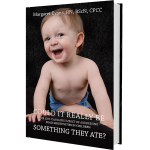 The EFSAT is the only accurate, cost effective, and non invasive way to identify the food that may be affecting your child. As an adult, you may now be suffering from symptoms that affect one or more of your body systems. You might be suffering with IBS, you may be struggling with asthma or chronic infections, your joint pain or fibromyalgia may be limiting your activity or you may be seeking answers to some type of autoimmune disease. Many symptoms and diseases have their origin in food sensitivities that began in childhood. As you grow and mature, symptoms often morph and change. Your childhood tummy aches or ear infections may be disappear, only to be replaced by hormonal fluctuations, difficulty learning, migraines, mood fluctuations or joint inflammation. While many symptoms are complex, in my over 30 years of work with hundreds of clients, I have seen amazing results when the offending food is removed from the diet.